This morning I confused my dog. For about a week now I have been listening to the New Testament on my ipod while I’ve taken Bobs for his half hour walk in the mornings. This morning we reached the story of the persistent widow, a story Jesus told to teach us to pray and not to give up praying. We reached this story just as we reached a road to cross. But I need to back-track and explain that Bobby is not allowed to cross roads without first sitting on command. And all those dog training classes taught me to deliver the command ‘SIT’ with confidence and sufficient volume to cause every dog within 10 yards to put their bottom on the floor! Here is a picture of the desired effect: it’s an instruction Bobby knows well. So picture the two of us walking along, approaching a road to cross, me engrossed in the podcast. I shouldn’t put words in his head but there could have been a speech bubble with the words ‘You want me to do what?‘ or maybe ‘You’re getting awfully bossy for a nearly vicar’. 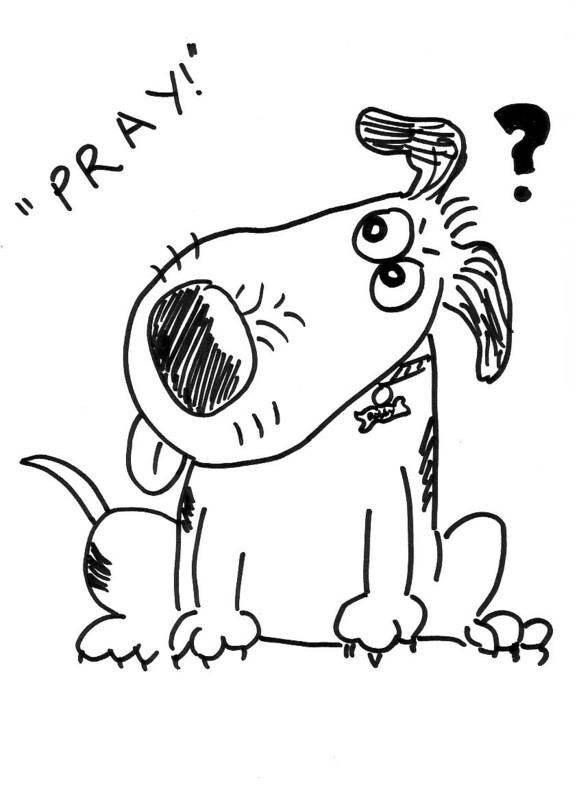 Having looked around sheepishly to see if anyone might have observed me on a street corner instructing my dog to pray (phew, no-one had), I then collapsed into a fit of giggles over the idea that I had made myself appear too terrified to cross roads, unless my dog prayed first! Bobby on the other hand had sat anyway, hopeful that this might be an acceptable response to my peculiar command. He gave me a superior look. The really funny thing about this little incident was the timing. Over my early morning ‘pre-Bobby’ coffee I had been reading Luke 11 and came to verse 9, ‘Ask and it will be given you, seek and you shall find, knock and the door shall be opened to you’. Tiring of this panto exchange, God sighed and I shut up. ‘Okay, I conceded. That’s probably true’. I picked up my little notebook, the one in which I write all the names of the people I pray for regularly (Heaven help you if you are in there, I’m doing my best but am still not very good at it! Mind you it is heaven’s help that you require, its actually very little to do with me). On the front I have stuck a quotation written out for me by a friend ‘Do not think that God’s delays are God’s denials. Hold on; hold fast; hold out. Patience is genius’ (Comte de Buffon). I gave a wry smile and headed downstairs for the dog walk and my daily podcast. When the reader began at Luke 18, the story of the persistent widow, I gave another wry smile. I think someone might be trying to tell me something here: as far as prayer is concerned don’t analyse it, don’t ponder on it, don’t question it, JUST DO IT (as Nike would say). 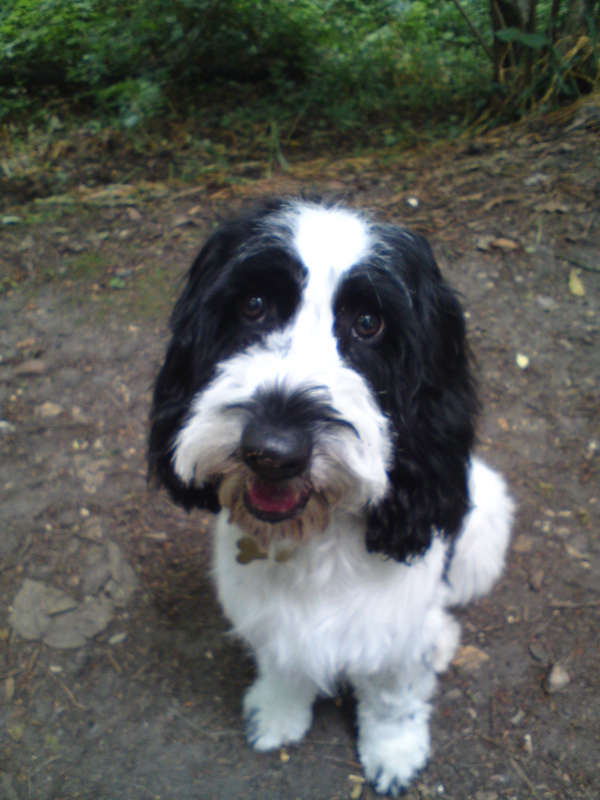 With Bobby looking quizzically up me, I realised I had something to learn from my dog: rare is the moment when I drop to my knees on the command ‘PRAY’. If only I did so as promptly as Bobby’s bottom hits the floor on the command SIT! Then maybe Luke 11 verse 9 wouldn’t give me any problems. ps. the excellent New Testament podcasts can be downloaded for free from http://www.biblesociety.org.uk/support-us/ygtt-2010/ there are 40, each 28 minutes long. The text is performed by the Riding Lights Theatre Company which means there is a variety of voices which helps keep your interest as I tune out to one voice going on and on. (Mind you, a ‘Jamaican’ John the Baptist is a little odd!) In 40 sittings you can hear the whole of the New Testament. How do you know Bobby, in his way, didn’t obey your command? I have a mental list of people I try to pray for each day (not always successfully) but I am increasingly drawn to the idea of prayer as a way of life and not an activity. Brother Lawrence’s idea of ‘practicing the presence of God’ would be my ideal. Regarding sayings of Jesus that we don’t understand I’m not going to try to give you any answers as I believe that the Holy Spirit speaks to us each as individuals through scripture. However I can offer 2 pieces of advice (if that isn’t presumptions of a lay Baptist to a priest in training): 1) Tom Wright’s ‘For Everyone’ books are excellent at giving the social and historic background to passages in the New Testament; this can shed a lot of light on the meaning and 2) We can’t, and don’t need to, know everything so if the answer isn’t obvious put the puzzle, as my former minister says, into a box marked “Waiting future light.” When we need to know God will provide the answer.